WiFi Internet Connection is slow or drops down when using Bridged Network Mode in Parallels Desktop for Mac Virtual Machines. The most probable reason is that the Wireless Network you are using blocks receiving separate IP address for your virtual machine. This issue was discovered on wireless networks based on Cisco wireless controller solutions. If you are using a Cisco Equipment and need to use Bridged Network Mode, please contact Cisco Support directly. The problem can potentially occur with other equipment manufacturers - please contact your system administrator to reach out to manufacturer's support. Click on Hardware > Network 1. Close the Configuration window and check your Internet Connection on your virtual machine again. 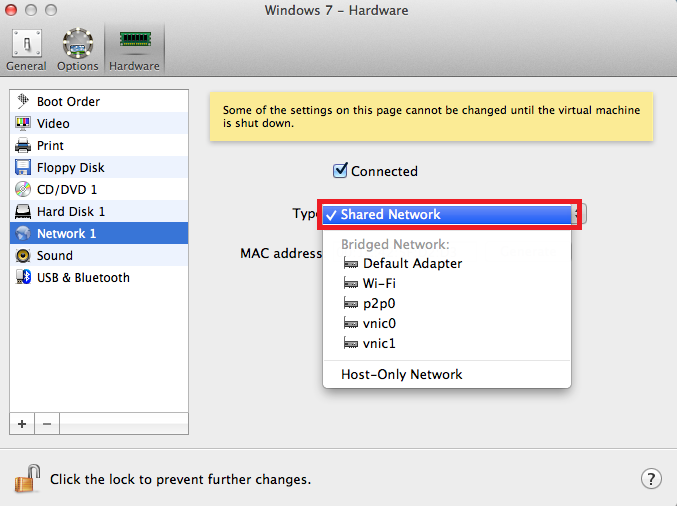 If you still experience issues with Shared Network Type, please refer to this KB article for more troubleshooting steps: KB 8978 Troubleshooting Network Problems in Parallels Desktop for Mac.